Home › Dorchester/Boston › Jamaica Plain: No comment. 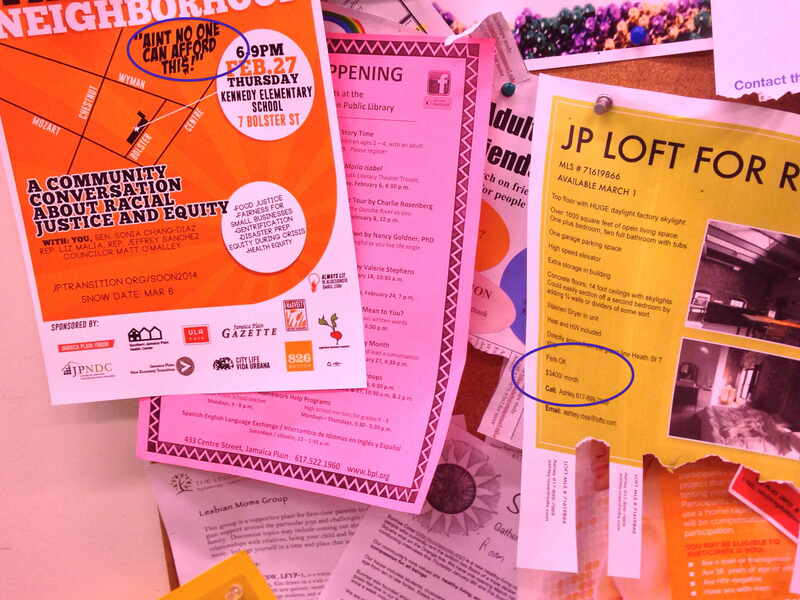 So I’m in the lobby outside Bella Luna Restaurant in the Brewery Small Business Complex in Jamaica Plain, looking at the bulletin board, and I spot the juxtaposition of these two notices on their community bulletin board. I’ve drawn blue ovals around the two points of interest, since there’s so much clutter. (If you have trouble reading the fine print, the one-bedroom loft is renting for $3400.00 per month.) What does this tell you about JP? ‹ Suppose math tells you something that goes against your preconceived beliefs. What do you do?